Stacy Slobodnik-Stoll of Haslett and Jake Kieronski of Wyandotte won the 2018 GAM Tournament of Champions Monday at Detroit Golf Club. The GAM Tournament of Champions is open to anyone who wins their Member Club Championship or a 2018 GAM Championship. There were separate divisions for men and women in an 18 hole, stroke play format (gross). The 2018 tournament featured 77 golfers. Slobodnik-Stoll, the winningest GAM golfer ever, won in a playoff over Julie Massa. 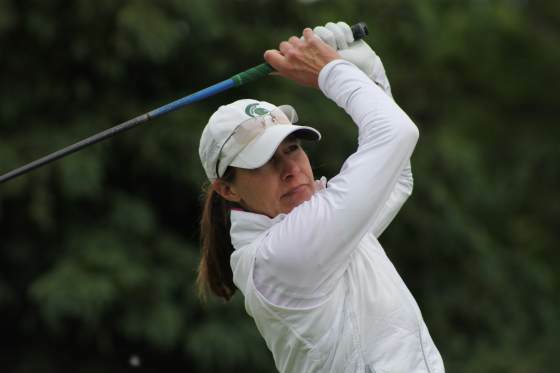 The coach of the MSU Women’s golf team, Slobodnik-Stoll has won six Tournament of Champions titles among her unprecedented 18 GAM Tournament victories. Runner-up Massa is the 2018 GAM Senior Tournament of Champions winner and has been GAM Senior Women’s Player of the Year in each of the last three years. “I think it helps to be in competition, go through the pressure and the things my players have to go through, and I want to keep a competitive edge,” she said after making a par on the first-hole of a sudden-death playoff with Massa. “It was great to play with Julie – she is a great competitor and she played an amazing summer schedule and has been so successful,” said Slobodnik-Stoll, who has coached Massa’s daughters at Michigan State. Kieronski won on the fourth hole of a playoff against three other golfers. It was his first GAM title. A 30-year-old independent insurance agent,Kieronski shot 2-under 70 in regulation play. Kieronski, who played college golf and baseball at Henry Ford Community College and worked in the golf industry previously, edged this summer’s GAM Mid-Amateur champion Scott Strickland of Bloomfield HIlls and Battle Creek Country Club Champion Bill Johnson. Kieronski is the 2018 Lakes of Taylor club champion.